Ready or not, the holidays are on their way. It’s that time of year when we all like to add a little more glitz and glam to our look. Even the guys take pride in looking debonair in their sleek suits during the holidays. Le Visage has an array of fabulous gifts that are the perfect match for the beauty buff and stud muffin you know and love. 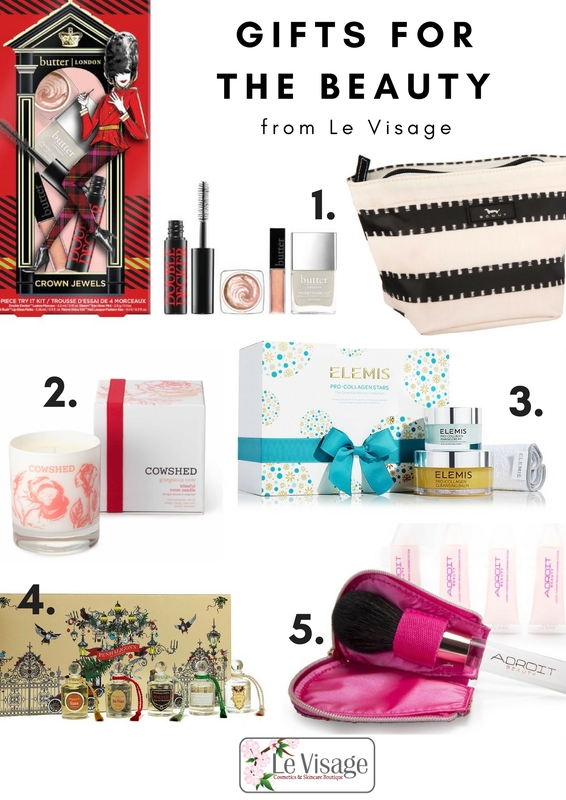 For the lady who is a bit of a beauty buff, whether it’s your bestie or sister who loves to look glamorous at parties and chic at the office, Le Visage has narrowed down the top 5 beauty essentials that make the perfect gift this holiday season. These top of the line cosmetics and skincare products will have you wanting to indulge a little and buy yourself something nice. Curious what makes these products so fabulous? They are all high quality, ethically made, and animal cruelty free. Butter London, is one of my personal favorites. The Crown Jewels 4-piece set is just fabulous! It is equipped with the basic beauty essential must haves. The collection has shimmery colors that are trending this holiday season. The Scout Crown Jewels Cosmetic Bag is perfect for storing your cosmetics and nifty to have to keep all your beauty essentials together while traveling. What is the perfect gift for the beautiful hostess? Scented candles from Cowshed! These eco-friendly candles are great for creating the perfect atmosphere for your next dinner party or holiday get-together. Get ready to have you home fragranced with notes of Ylang Ylang, Moroccan Rose, Palmarosa and French Lavender. Cowshed candles use wax that is 100% biodegradable and made from a renewable source. This skincare set has just made your beauty routine a whole lot better. The products focus on cleansing, firming and smoothing skin. This collection is great for the skin and has the planet in mind. This skincare set is clinically proven and uses ingredients from the sea to help with anti-ageing. For the lady that likes to travel, this collection of perfumes are inspired by travels from afar. Each bottle of perfume is a time capsule transporting you to an era of exploration and daring adventure. Penhaligon’s Trade Routes collection is an exotic palette of fragrances. Bonus, this perfume collection is animal cruelty free. This is a great makeup kit to have. A girl’s makeup brush is fundamental, but they don’t last forever. It is important to change out the old and bring in the new. The little pretty pods are specifically designed to keep your makeup brushes clean and in great condition. I think it is safe to say that when guys are getting ready for work or a party they like to keep things simple. 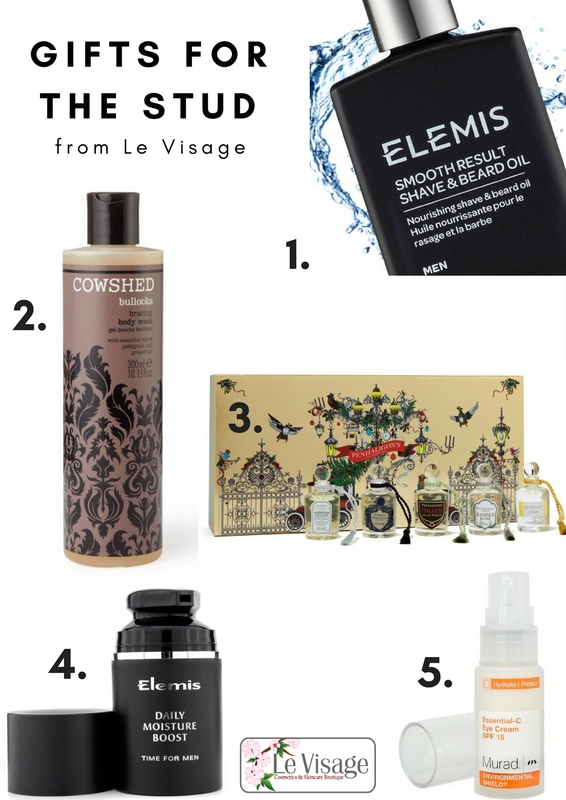 For the man who takes pride in grooming to ensure he has that debonaire look, Le Visage has a list of 5 essentials to keep you looking like a stud. As an added bonus, these products are ethically made and animal cruelty free. Gentlemen, this one is for you. Grooming and shaving is gonna be a breeze this holiday season. This multi-purpose nourishing oil softens bristles and prepares skin for the ultimate, close shave. Curious what ingredients make the perfect smooth shave? The active ingredients are: Jojoba, Hazelnut, and Grape Seed Oil. This body wash has a burst of citrus with ingredients such as grapefruit and bitter orange. It is free of sulphates and environmentally friendly. This fragrance collection will compliment any gentleman who likes to get a little festive during the holidays. The five piece set is sophisticated with five legendary scents: Blenheim Bouquet, Endymion, Halfeti, Juniper Sling and Quercus. This daily moisturizer is great to apply right after shaving to keep skin nourished and hydrated all day. A fantastic lightweight daily moisturizer to help defend skin throughout the day from external pollutants. Let’s face it even men like to keep their skin looking great. This essential eye cream helps with anti-ageing, keeps the eye area hydrated and reduces puffiness. So boys, you can keep calm and party on. As an added bonus it has SPF 15 to help with protect eyes from UVA/UVB rays.